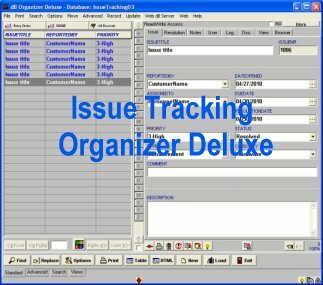 Issue Tracking Organizer for Windows: simple database management software that helps you to manage any kind of issues (project issues, customer service issues, help desk issues, ...). Includes several issue database templates to choose from. Very fast and easy data entry. Search, filter issues by any field. Sort issue records by any field. Several user-definable data fields. Many flexible issue database processing features. You can modify databases included in the system. Many additional project management databases ready for download. This site does not contain serial number, crack, keygen Issue Tracking Organizer Deluxe serial number : serial number is the simplest type of crack. A serial number(cdkey,product key,etc) is register the program as you may already know. a crack or keygen may contain harmful software. If you cannot find the exact version you want, just give it a try. for more information read .nfo/.txt/.diz file include in zipped file.